The second round of the Phuket Vegetarian Festival starts tomorrow (running until November 1st), marking the first time in history that the festivities will have been held twice within 1 year. Apparently, this anomaly is due to a rare alignment in the Chinese lunar calendar, meaning that this year has two 9th lunar months—the 9th lunar month being the month assigned for the celebrations. 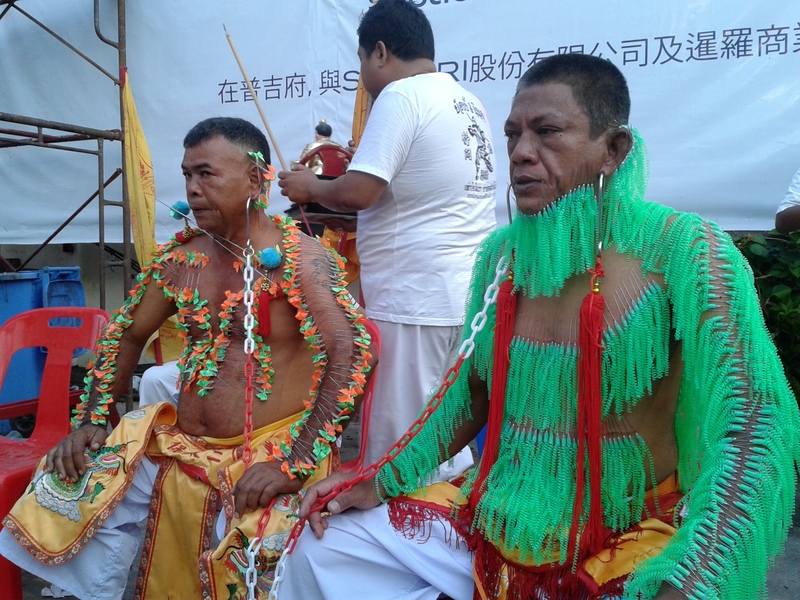 Although the availability of delicious (and cheap) vegetarian food is a major selling point for the festival, the big draw is really the “mah song”—the devotees whose bodies are taken over by the spirits of gods during the period. 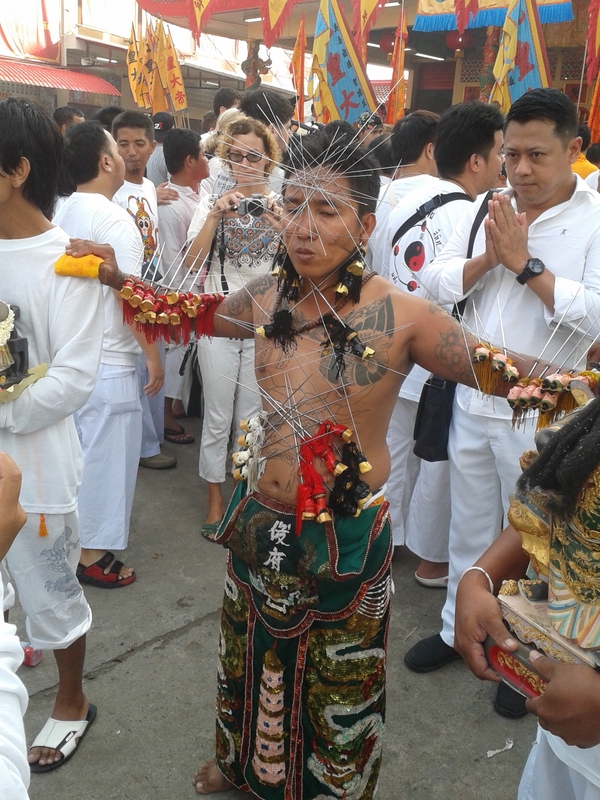 They are said to feel no pain when possessed, performing extreme piercing, fire walking and bladed-ladder climbing rituals to the amazement of onlookers. At the end of last month, I travelled to Phuket Town to catch part of this year’s first vegetarian festival (held between September 23rd and October 3rd). On consecutive mornings, I visited Jeng Ong and Bang Neow shrines to watch the piercing rituals, followed by the street processions around Phuket Town. At both venues, peculiar noises emanated from within the shrines when the mediums had their bodies taken over by spirit gods: palms slapping on wooden counters, whips cracking, high-pitched shrieking and low-pitched “woofing” sounds. Gradually, the mediums (predominantly men but a few women) emerged—in trance states—shaking their heads, gurning, drooling and barking, with vacant eyes. I watched several piercings and don’t believe that the mediums experienced any particular pain during the procedures. The piercings were actually performed by skilled assistants, who maintained some standards of hygiene by wearing surgical gloves and liberally applying alcohol to the sharps, though they also applied cooking oil (I assume for lubrication), which I’m not sure would have been entirely sanitary. 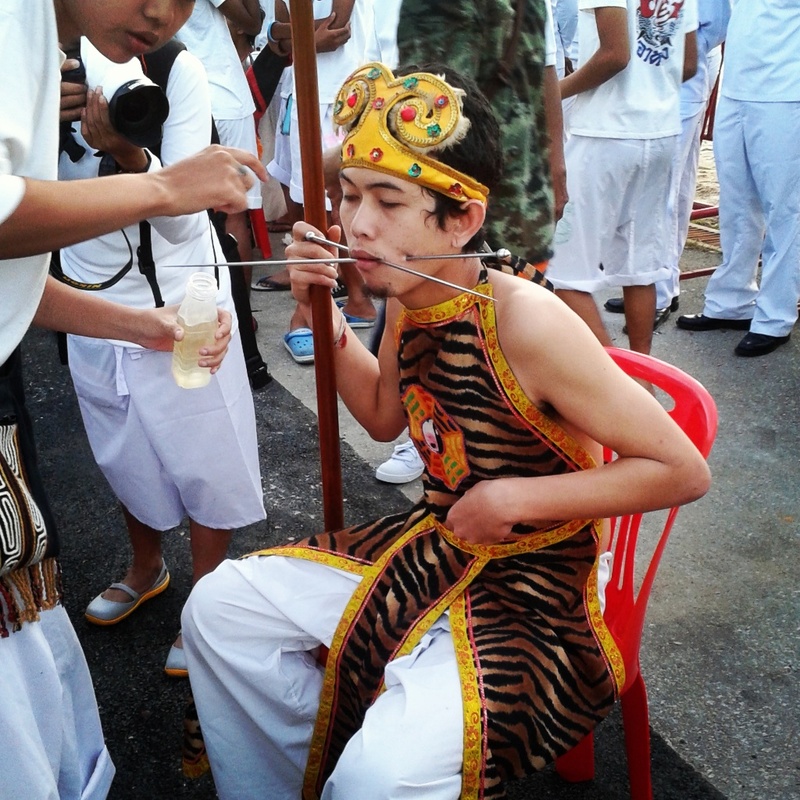 Other assistants (“pee liang”) accompanied the mah song on the street processions, helping to support heavy piercing objects, wiping up saliva using toilet roll, and applying Vaseline to stop any bleeding. Some of the objects that had been used for the piercings were pretty outrageous, including bolt cutters, a spade, ten-pin bowls, guns, flag poles and (my favourite) a bicycle! Two sights unsettled me during the festival. Although I barely flinched at the piercings, watching two mediums use the same long saw to lacerate their tongues until blood spilled down their chests made me queasy and uncomfortable. I was also concerned after seeing a small, relatively young mah song with a bad facial injury. A medium-sized sword had been used to pierce his cheek, which had created a large gaping wound, and Vaseline was doing nothing to stem the stream of blood running from the lesion. His pee liang shook his head resignedly, said a prayer and blew on him, then accompanied him back to the shrine to seek medical assistance. The processions around Phuket Town were loud, spectacular and exhilarating. Most businesses had closed temporarily and the streets were lined with local and international spectators. Some onlookers had set up red fabric-covered tables offering fruit, Chinese tea and flowers to the mediums. Large pickup trucks followed the processions, blasting out festival music, and when rolls of fire crackers were set off, the noise crescendoed to a deafening volume as clouds of smoke filled the air. 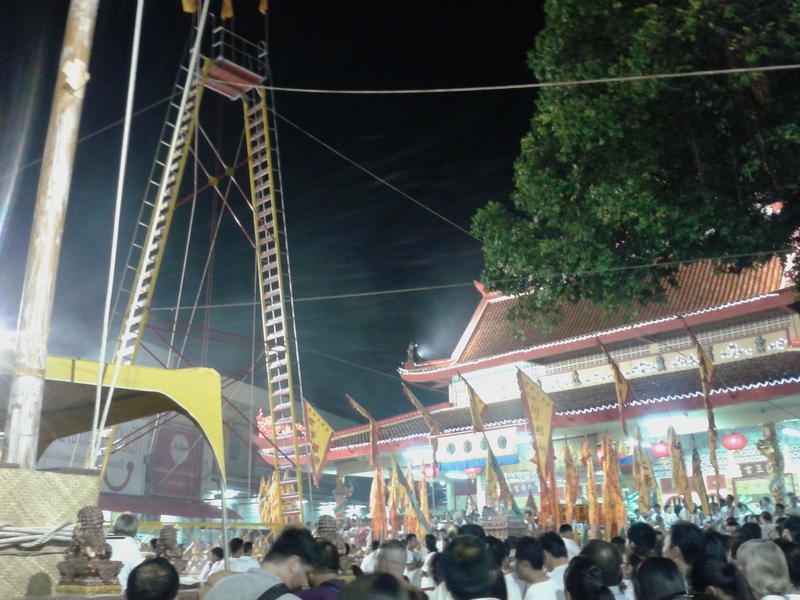 My final vegetarian festival experience was the bladed-ladder climbing ritual at Bang Neow Shrine. A tall structure consisting of two ladders with blades for rungs (demonstrations of fruit being chopped on the rungs proved their authenticity), connected by a small platform, had been erected in the shrine forecourt. The area was heaving with spectators—a far greater number than had attended the piercing ritual two days prior. The ceremony itself wasn’t actually very interesting, though an announcer did iterate that “it’s a ritual, not a performance”. Sequentially, the mediums emerged from the shrine, climbed up one ladder, threw small pieces of Chinese yellow cloth from the high platform, and then descended using the opposite ladder. More interesting was watching what I think was the process by which the spirit gods left the mediums’ bodies, and involved axe-swinging, whip-cracking, slapping the shrine altar violently and emanating those strange “woofing” noises. Then, the mediums suddenly leaped back and collapsed—exhausted—into the arms of an assistant, apparently god-free. The process was rather theatrical (maybe even staged?) and made more than one onlooker (or was it just me?!) laugh out loud. Phoney or not, the Phuket Vegetarian Festival is the most stimulating and interesting festival I’ve experienced in Thailand. If you are able to travel to Phuket within the upcoming 9 days, I definitely recommend attending the festivities, which will be held, this time, at Kathu and Cherng Talay shrines only. Go early to catch the piercings (before 6am if possible), be sure to watch the street processions, and enjoy the sensory overload. First, I heard that Master Toddy is going to try to find your Calderwood fight via Channel 7. Given the huge amount of stuff that’s on video, it’s amazing that such a high profile fight has gone missing. Second. 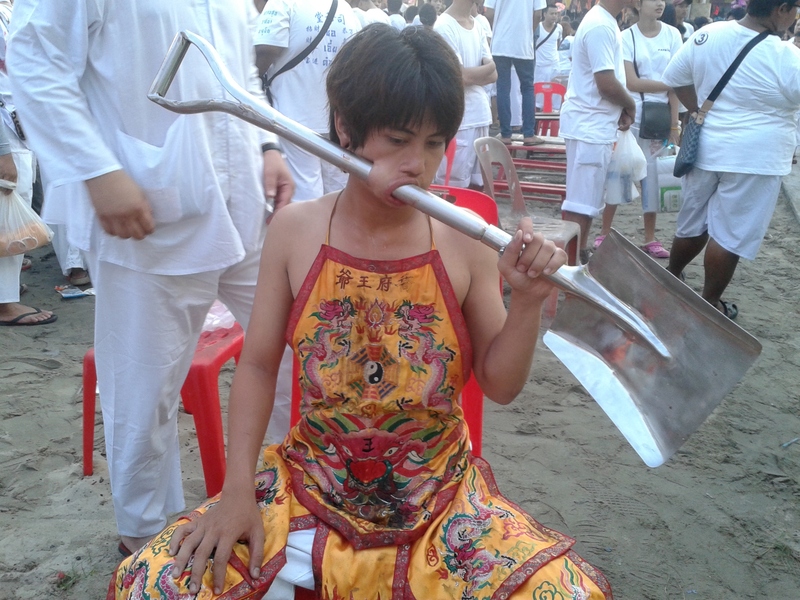 thanks for posting the stuff on the Vegetarian festival. I’d heard about it but never seen videos. It’s certainly impressive that they show no sign of pain at all in the second piercing video, but I don’t really believe all the stuff about mediums. Surely it’s nothing magic, just very well-developed self-discipline. My guess is that It’s no different from the sort of self-discipline that allows you to take a hard punch or elbow without flinching, and come back for more? I know it’s said that orientals are better at that than westerners, but I suspect that isn’t true either, as many people (including you) have proved. The fact is that anybody who competes in a combat sport has trained themselves to endure a level of pain that would seem like torture to the non-cognoscenti. It’s all part of the deal. Sadly it doesn’t show the whole fight, but fascinating none the less. One thing I noticed is that they are the wearing standard western boxing trunks of the time, rather that the elaborately embroidered Thai shorts that are standard now. Does that mean that today’s version isn’t really traditional at all -more of a fake tradition? Ha, could be! Thinking back to the photos I’ve seen from old magazines, the shorts worn by the fighters were quite simple and unfussy. Interesting clip. For some reason I expected the old-style fights to be very technical but that one seemed a bit of a brawl! As for the vegetarian festival……yes, the mind is definitely powerful. I don’t believe in spirit gods either but I believe the “mah song” genuinely do, allowing them to do such things to their body without feeling pain. But of course what I didn’t find out was what happens after the street processions when (I assume) the piercing objects are removed. Do those men and women need stitches and bandages? I’m also interested to know what they do the rest of the year. Are they just ordinary 7-11 workers, for example?! One thing that surprised me about the festival was that at no point was I asked for any money. There were no donation boxes and water and other drinks were given away free at the shrines and during the street processions. The festival is said to bring huge revenue to Phuket Town. I can see that hotels, shops and restaurants profit from the influx of tourists and I’m sure the shrines most receive donations, but I wasn’t harassed for money, which can be the case at some festivals/tourist events.